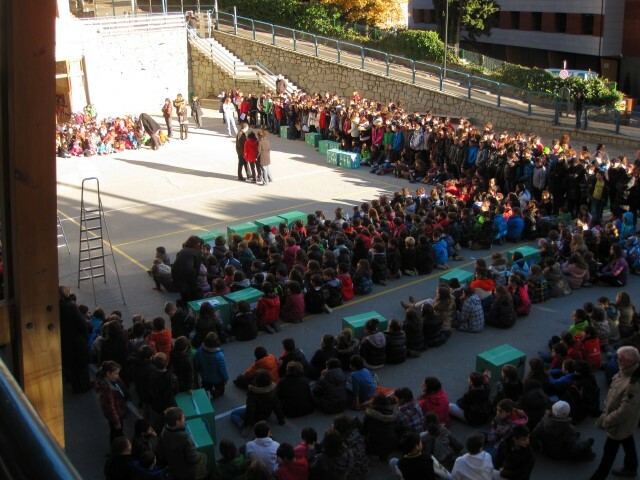 Mare Janer was the first school in Andorra to join FECC’s Programa Auxiliars de Conversa. It is their second year hosting a Conversation Assistant. 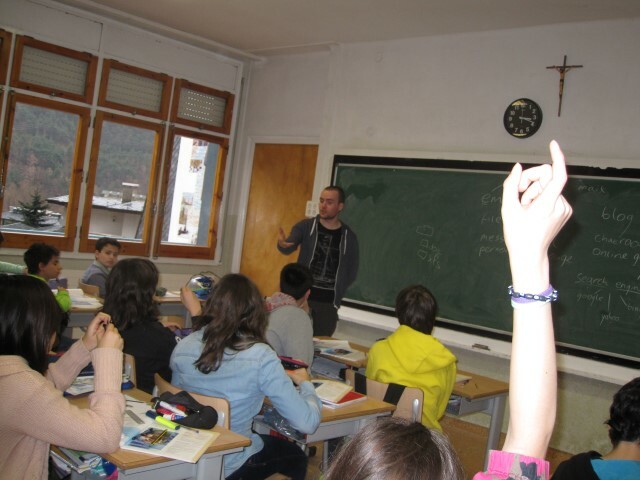 Just like last year, their CA, Chris, has felt very welcomed in Andorra and is helping Mare Janer’s students’ improve their English skills. Thank you Chris and her tutor, Esther, for writing to us! My name’s Chris and I am the second conversation assistant at Mare Janer in Santa Coloma, Andorra. 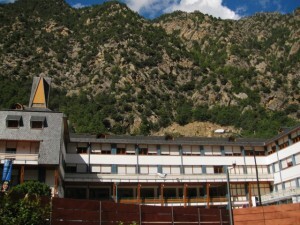 Mare Janer is a semi-subsidised Catholic school nestled comfortably at the bottom of a huge mountain face. 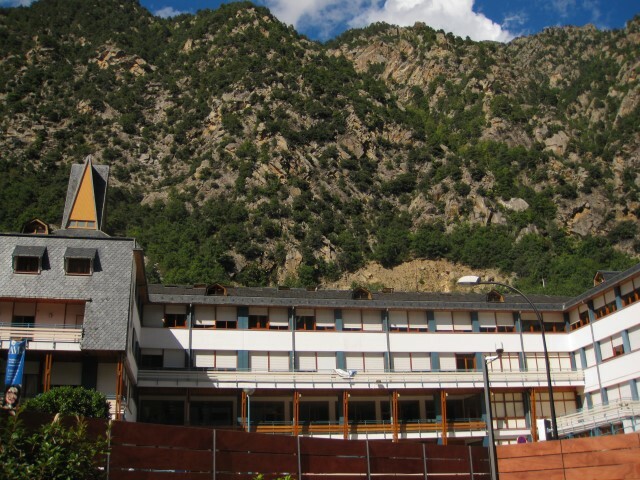 That’s not saying much, however; almost everything in Andorra is nestled at the bottom of a huge mountain face. One thing that strikes me about the school is, for the most part, how well the students are behaved. I cannot find a displayed list anywhere of the school rules, not on the walls or in the classrooms – all the students just seem to know what the rules are and how to behave. When there was one fight between two students, it was talked about throughout the entire school. I’ve come from a very different environment personally, so it’s a humbling experience that makes you think a lot about culture and upbringing. The school itself has its own genuine forest; not a forest behind or next to the school, but as a part of the school grounds, where the children go to play at lunchtime. This is what I thought was the most wonderful aspect of the school – imagine the adventures you’d have every day growing up in a place like this. The forest is completely at my own disposal, so generally at lunchtime I will find a quiet spot to sit on a rock and do some drawing. Within minutes it’s no longer quiet as I’ll be surrounded by adorable screeching children asking me what I’m doing, and pointing at objects and demanding I say the Spanish word. I find speaking with the children in this way is the best way to learn and practise basic Spanish, and it helps them as they simultaneously practise their English. One difficulty I’ve encountered is in attempting to refine the kids accents. Because for almost my whole working life I’ve been around mostly non-native English speakers, it actually sounds more natural to me to hear strong accents. And as I think accents are a wonderful, beautiful aspect of identity, it seems almost a shame to flatten it out, but of course it is a great aid to the students to practise from as young as possible. The most astounding thing is to see the generosity and openness from each of the host families. They are taking a huge risk inviting a stranger into their homes, at a substantial financial expense too, while only asking that the assistant be with them and talk to them at dinner. They are the real people who keep the CAPS program together, and my host families will always hold a special place in my heart.